← Wonderful Wednesday – some notes about the goodness! Lovely Linkage – Holiday fun to tide you over. Liz's own J. 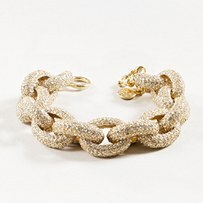 Crew pave link bracelet. So, apparently book clubs and wine clubs are passé – it’s time to put on your heels and lipstick and play bridge! My neighbors and I are starting in January. Here is Ina Garten’s recipe for insane truffled roast beef sandwiches – perfect for bridge. Again, I stalk that house in East Hampton (23 Buell Lane, people!) Oh, and if you, too, want to “fix” Ina’s show, read this blogger’s take. Refinery 29 (an F4 favorite) taking the arm candy story and blowing it up. What’s more luxurious than a Snuggie? Why, a Nuddle of course. That Kelly Rutherford of “Gossip Girl” made me buy a few on Open Sky. All kidding aside, The Joyful Heart Foundation, an organization near and dear to me, has a shop. Buy your Nuddle here and one will go to a sexual assault or domestic violence survivor. Even a trip to Whole Foods is glamorous for my fashion/art girl crush, Jenne Lombardo. What do YOU think of the Kardashian’s Khristmas Kard? Here’s Michael K’s hilarious take. Swoon – check out this fabulous wedding at San Ysidro Ranch. One of our favorite venues to plan weddings – you should check it out. The cake! The bride’s chunky jewelry! All of it. Courtesy of Style Me Pretty. Happy Hanukkah from all of us and Mrs. Lilien. Posted in food, holidays, Links, party planning, weddings, winter and tagged Hanukkah, Ina Garten, Jenne Lombardo, Joyful Heart Foundation, Kardashians, Kelly Rutherford, Style Me Pretty. Bookmark the permalink.